The Sea Gull Lighting Trempealeau four light vanity fixture in roman bronze provides abundant light for your bath vanity, while adding a layer of today's style to your interior design. The Neo-classical silhouettes of the Trempealeau lighting collection by Sea Gull Lighting feature a beautiful, forged metal "twist" detail, which when coupled with the warm hues of the Champagne Seeded glass delivers a pastoral design which will transport you abroad to French wine country. 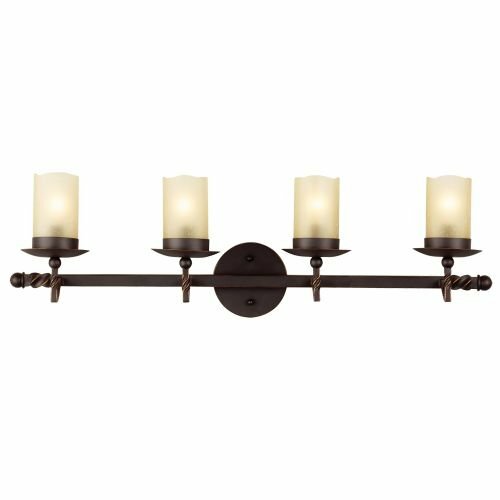 Offered in the Roman Bronze finish, the full lighting collection includes a 12-light, six-light and three-light chandeliers; 16-light, six-light and four-light foyer fixtures (all of which have adjustable arms which can be positioned facing up or down); a mini-pendant; three-light and four-light pendants; a two-light semi-flush mount; and one-light, two-light, three-light and four-light bath fixtures. If you have any questions about this product by Seagull, contact us by completing and submitting the form below. If you are looking for a specif part number, please include it with your message.